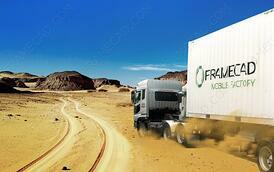 FRAMECAD’s Mobile Factory is revolutionary advancement for building projects that are time critical and challenging. The Mobile Factory can house various FRAMECAD manufacturing systems, can be placed anywhere it is needed and become operational and manufacturing LGS frames within hours. In the past, rapidly deploying the construction of buildings in remote, hard to access areas or in situations where there is no access to infrastructure, such as disaster zones, has been notoriously difficult to undertake. With FRAMECAD’s Mobile Factory solution, governments, builders and communities around the world are now able to solve this problem, faster than ever before. When a shallow earthquake struck northern Pakistan in October 2005, one of the most devastating in history, it left over 3 million people homeless. Rather than deploying traditional construction methods, local Pakistani company Metecno turned to FRAMECAD and the revolutionary Mobile Factory to provide emergency relief.Plans for a series of simple, Light Gauge Steel (LGS) framed houses, which could be quickly constructed in large numbers, were developed and once the Mobile Factory was set on-site, construction began immediately. By using FRAMECAD In the face of a devastating natural disaster, Metecno were able to provide shelter to those affected almost immediately — before many international aid agencies had even been able to respond. Disaster relief response is one powerful application of the Mobile Factory, and today this solution is being applied across the construction industry to solve the growing demand for mobile construction solutions. From constructing in remote locations, hard to access sites and sites with limited infrastructure - to commercial projects where the ability to construct rapidly from a controlled environment on-site is advantageous, the Mobile Factory is solving big problems for governments, builders and communities. What is the FRAMECAD Mobile Factory? 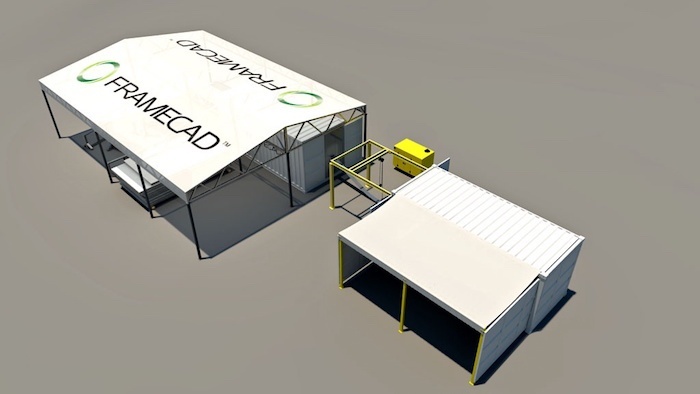 FRAMECAD’s Mobile Factory is a completely secure, self-contained light gauge steel (LGS) frame production facility housed in a modified 40ft-shipping container, complete with its own diesel generator and computer-operated FRAMECAD fabricating machine. The Mobile Factory’s on-site, compact nature, means it can be immediately shipped, trucked or airlifted into any location and made operational within 24-hours of delivery. As it is fully self-contained, there are no additional framing materials or moving vehicles to be transported to site reducing overall construction lead times and costs. The container is reinforced to ensure it can sustain the weights and loads required to manufacture LGS frames and store steel coils. And it is fitted with FRAMECAD machines, and a decoiler already installed and aligned so that manufacture of framing can begin immediately. One coil can produce a building of approximately 4m by 4m in a matter of half a day. A key feature of the Mobile Factory is that it is fully-insulated to protect machinery from external elements and is equipped with an air-conditioning unit to ensure that the people and equipment can operate in optimal temperatures. And an innovative gantry unit makes the process of loading steel coil into the container and also onto the decoiler easy, eliminating the need for a forklift. Where time is crucial and it is impractical to rely on traditional methods or commission a new factory, the Mobile Factory can be quickly deployed. 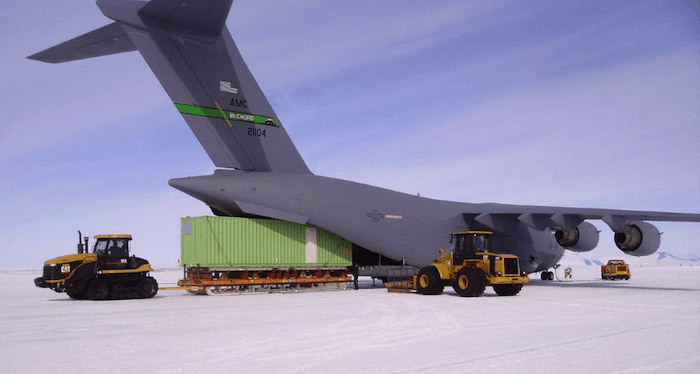 For example, the Mobile Factory is used by the US Navy in humanitarian construction efforts often carried out in remote areas with little in the way of local resources, tools or even power. The Mobile Factory provides the US Navy with a fast, reliable building system and has a large impact on the Navy’s ability to rapidly provide humanitarian assistance. The demand for rapid on-site construction for commercial projects is increasing. LGS construction and the Mobile Factory is suited to meet real time, on-site requirements for large projects such as new residential developments, where time, cost and the benefit of a controlled manufacturing environment are advantageous. For example, in the Middle East, Spacemaker, a leading manufacturer of off-site modular and hybrid methods of construction in Qatar uses the Mobile Factory to improve the company’s ability to service other markets throughout the Middle East. “Basically, we can put the machine in a container and ship it to wherever it’s required and manufacture framing on-site. If we can build more efficiently, we can build faster and that’s what’s required in this region”, says Paul Wykes, Specialist Divisions manager for Spacemaker. Immediate production of temporary and permanent structures such as hospitals, relief centres and housing can begin within hours of the Mobile Factory arrival, with the first structures completely erected within 24-hours of siting as highlighted by the Pakistan example. Find out more about the FRAMECAD Mobile Factory solution. Are you a construction company or government agency with a residential development project? Talk to a FRAMECAD expert today about how LGS can save you time and cost.